When I was 13, I was FINALLY old enough to go on a trip to New York City with the dance studio. My mom was coming as a chaperone, and 3 of my best friends were staying in the room with me. We had a fun night when we got there, we saw a show and went out for dinner, and the next morning, my little dance dream came tumbling down. I realize now that the criticism from my teacher that morning probably came from frustration, having to organize this huge group, and partly because of Cushing's. I started having symptoms around 13, which probably threw my whole body off. I was gaining weight, after being a skinny tall kid my whole childhood, I was probably in that awkward clumsy phase with the start of Cushing's. Or was it the opposite? Did this traumatic event in my young life somehow contribute to Cushing's? I have read before that sometimes great trauma or stress as a child can contribute to the excess cortisol production. I tried another dance teacher in a new studio with new kids for a few weeks, but eventually decided that my self confidence was so crushed that I didn't think I could dance at all anymore. 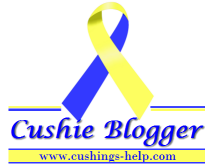 I was less active, so that helped with the weight gain, and from then on things just spiralled out of control until 10 years later, when I was finally diagnosed with Cushing's Disease. I sometimes wonder if this was the hiccup that set my life on a different path, or if it was always meant to be this way. I guess I won't ever know. Were you active as a child before Cushing's? Did you become less active as you developed symptoms?